Kate Schechter would like to know why everyone she meets knows her name - and why Thor, the Norse god of thunder, keeps showing up on her doorstep. It takes the sardonic genius of Dirk Gently, detective and refrigerator wrestler, to get to the bottom of it all. Was the passenger check-in desk at Heathrow's blasting through the roof really an Act of God? (And if so, which?) What's going on at Woodshead Hospital? And why is a severed head spinning on a turntable, its body sitting amiably nearby? 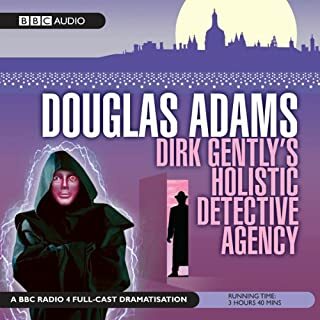 Only the sleuthing of Dirk Gently can uncover these mysteries, and only the absurdist wit of Douglas Adams can recount them with such relentless humor. Douglas Adams is easily my favourite author so I may be biased. He has a way with words that is unexpected unique and often hilarious. If you could sum up The Long Dark Tea-Time of the Soul in three words, what would they be? Dirk Gently's unique stance on life. What about Douglas Adams’s performance did you like? He inhabits this character, and makes me believe it's him to some extent... Arthur was him too, but less obviously so. Lot's of laughs all the way through... too many to single out one. I haven't finished the book yet (about 60% through) but it's already repaid me in absurd fun! Out of the two 'Dirk Gently' titles written by Douglas Adams this is probably the weaker. Don't get me wrong, it is incredibly funny in his usual style, the detective logic is spot on and some of his observations are genius. The problem is that Adams sometimes can't find good ways to finish his books and I feel this is especially true with this title (I won't give away the ending). Also a plus is Adam's reading as his dry wit fits perfectly with the tone of the book and he obviously understands how his material should be read. 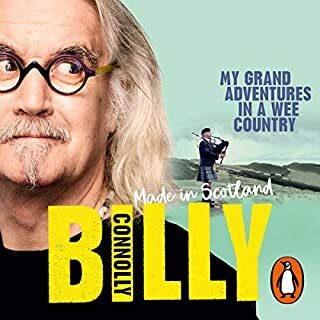 Overall I would say this is definitely worth a look as although the ending is weak, the story is one hell of a funny journey. I had so much fun with this book I nearly crashed the car. When I first read the "Hitchhiker's Guide to the Galaxy" I thought it couldn't get any better, but I actually enjoyed "Dirk Gently" even more. This story has absolutely everything you could ask for and more: mystery, comedy, science fiction, science fact, murder, suspence, ghosts, robots, aliens, demonic posession, theology, evolution, time travel, and an electric monk. You'll have to listen to it to know what that last one is. I strongly recommend it. Douglas Adams Rules on Two Fronts! Ok, everyone has read and/or listened to and watched The Hitchhiker's Guide to the Galaxy (right? ), but honestly, that was where my knowledge of Douglas Adams began and ended. So when LDTTOTS was listed as a Daily Deal offering, I grabbed it. 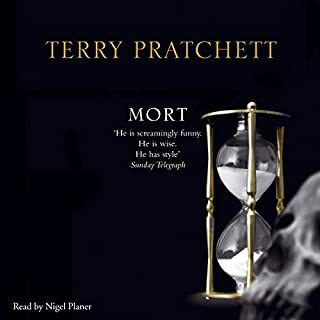 If you enjoy British humor and a little absurdist surrealism in your fiction occasionally, give this a listen. Ok, so the book was very good. What I did NOT realize was that Mr Adams also narrated this book, & unlike many who have failed at the task before him, Adams soars. 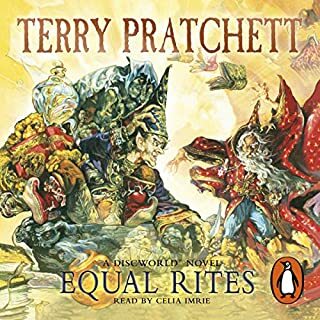 Just hearing him calling out Odin in a challenge (as Thor) towards the end of the book in this searing howling voice was enough to give him 6 stars on a scale of five. Douglas Adams (DNA) is rightfully famous for the Hitchhiker's Guide to the galaxy and all its configurations. There are two novels introducing the incomparable holistic detective, Dirk Gently. 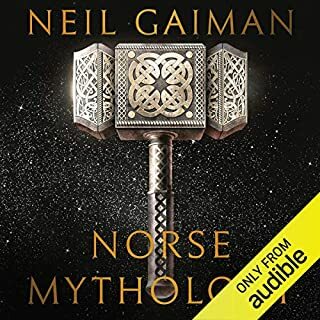 One is The long, Dark Teatime of the Soul, a gem of a story that weaves together Adams' English dry wit, a murder mystery and the Norse gods mythology. Who else would think of the fact that gods are immortal, but maybe in need of a rest home and linen sheets while hoping for a career in soft drink commercials? 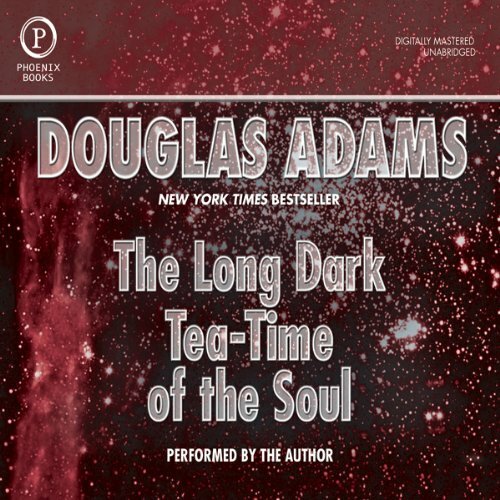 What other book might you compare The Long Dark Tea-Time of the Soul to and why? 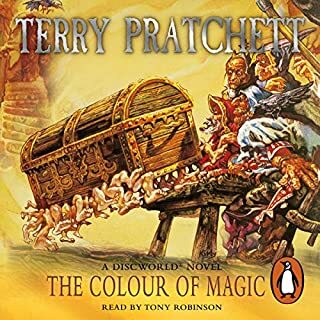 Dirk Gently's Holistic Detective Agency, of course and maybe a few of the Terry Pratchett Disk World novels. What does Douglas Adams bring to the story that you wouldn’t experience if you just read the book? Besides laughing out loud, you mean? The scene with the murdered man's son in the attic room is priceless. 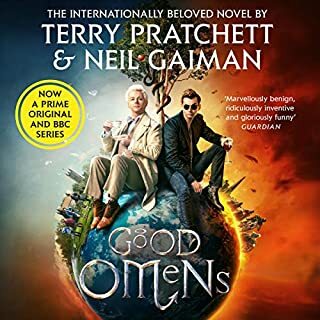 If you like this novel, there is a good chance you will also love Terry Pratchett and Neil Gaiman. If you're reading this, get the book. Adams' narration is like his writing, playful, expressive and clever. I'm a bonafide Douglas Adams fan. I've read everything I could find that he wrote, I've listened to all the dramatizations that the BBC did for H2G2 and I played his computer game and watched his talks on Youtube. That being said I'm sad to have to write that this book "The Long Dark Tea-Time of the Soul" was not his finest effort. Don't get me wrong, it's not bad, just not up to his snuff. Normally he ties up all the loose ends quite neatly and quite imaginatively but here I felt that there was a bit that wasn't quite finished. If I was to guess I would say that he was rushed to finish the book and just didn't have the time to polish it to his usual high luster. Douglas reads this and he reads it wonderfully. His tone, inflections and rhythm makes the story so wonderful to listen to that I found myself sitting in my car lost to where I was and just listening to him read. Quite wonderfully hypnotic. 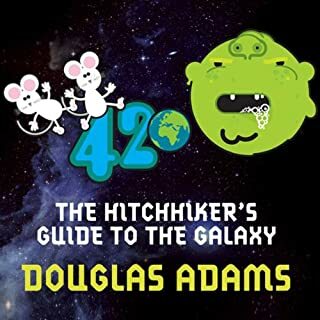 If you a Douglas Adams fan you'll HAVE to listen to this because ... well ... you know why, but if you're new to Douglas' work then you might want to skip this and listen to either "The Hitchhikers Guide ... " or "Dirk Gently's Holistic Detective Agency". This is a story of wonderful descriptions and perfect tangents. I've listened hundreds of times and it feels like home. Douglas Adams has a triumphant plot that takes its time developing. If you're confused, don't panic; the plots come together. The theme is the fundamental connectedness of all things. 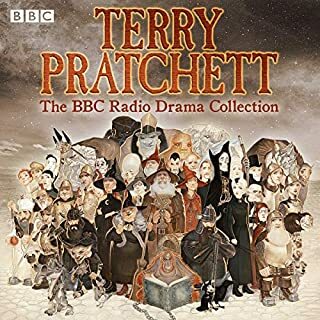 I have read all of Douglas Adams' books many times but loved this audible version by the author himself. Intelligent, humorous, and creative. You can't go wrong with this one. Douglas Adams has such a unique point of view, I wish there were more Dirk Gently tales. I can't choose my favorite character, I love them all. Kate is a great protagonist and Toe Rag is the perfect little troll. Nothing deep about this book, but very entertaining, and I'm sure I'll enjoy it more than once. 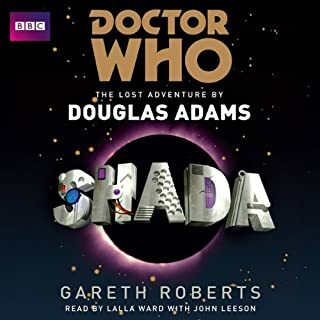 I'd forgotten how good Douglas Adams was until I listened to this, the second book featuring Dirk Gently and his Holistic Detective Agency. 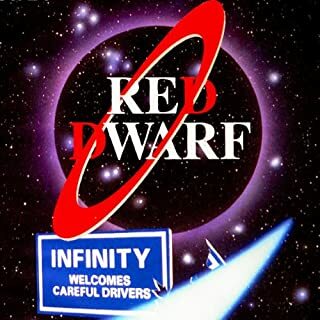 It's narrated by Douglas Adams, which means that all the subtlety and nuances are exactly how the author intended. 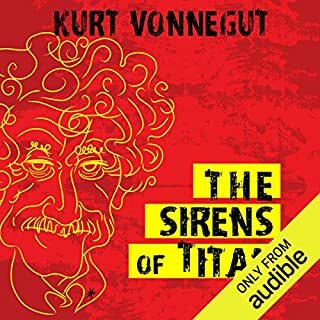 The story itself is darkly funny and utterly surreal, and has some of the best comic lines I have heard in a long time. I don't want to give plot details away, but Dirk is a somewhat unusual private detective who believes in the interconnectedness of all things, and who practices an unusual form of navigation whereby he follows someone who looks like they know where they are going. Gods are involved, and so is crisp, freshly laundered linen. And an eagle. I have long been a great fan of Douglas Adams. His style and sense of comedy being fantastically different to any other authors works that I have read. The stories or Dirk Gently take a little detour from the better known stories from the Hitchhikers Guide to the Galaxy. My first impression was that I had downloaded the story using the wrong quality... Then I realised that the mistake was not mine, but that the recording itself sounded like it had been recorded from a cassette playing over some earphones into a microphone and extra emphasis placed on the sssssssss's and the recording made to sound as thin and ethereal as possible. 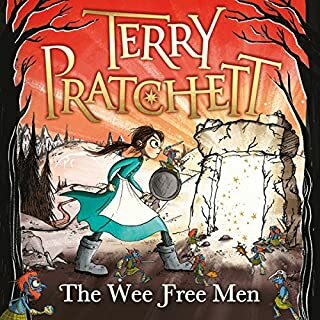 I have other Audiobooks read by Adams and have been very pleased by the sound of the Authors voice bringing the story to life. Giving meaning to passages that other narators would miss, or fail to understand to the same extent. Adams was a genius and his stories are testament to that. The quality of this recording does not do justice to the Author though. I think that the original recording would have sounded far better since Adams himself was an Audiophile and would not have allowed a poor recording to go out with his name on it. In short, it sounds thin, reedy and excessively sibilant. Great story, Well read, Poorly recorded. Long dark tea-time of the soul is the wildly wonderful sequel to Dirk Gently's Holistic Detective Agency. As well as being an exciting tale of belligerent eagles; forgotten gods; and neglected refrigerators this is also one of the increasingly difficult to find readings by the author himself. Nothing can compare to hearing Douglas Adams bring his characters to life. 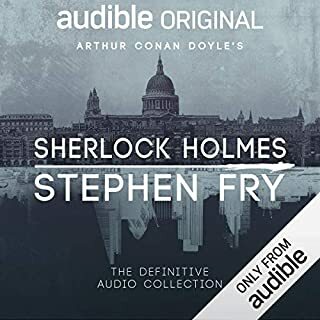 I only hope Audible can get their hands on his Hitchhiker's readings as well. If you are an Adams fan why are you still reading this? 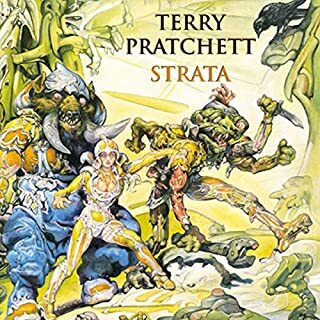 Buy this recording now! the quality of the sound recording is poor and has a fair bit of noise. 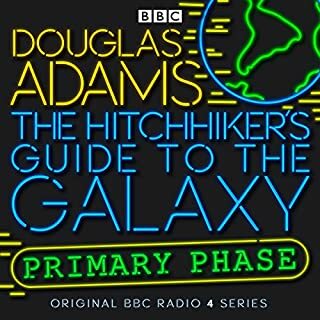 I hope audible will come up with Douglas Adams narration of HHGTTG. Only he gets the correct timing for his comedy. What did you like most about The Long Dark Tea-Time of the Soul? So enjoyable to hear Douglas Adams reading his own work. No danger of the narrator misinterpreting the authors meaning. I just love the idea that immortal MEANS immortal. All of humanity's "gods" are still out there - somewhere. His own interpretation of the characters he created really brought them to life for me in a way reading it myself never did before. Dirk Gentley - Holistic detective to the gods. Probably the least well known of Douglas Adams books but it still has the humour and out of the box thinking that makes people love Hitchhickers. The humour and Adam's performance. Have you listened to any of Douglas Adams’s other performances? How does this one compare? Not yet, but this was great. 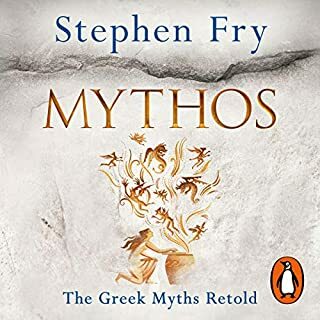 He doesn't differentiate between character voices as well as other narrators, but this is a cracking book nonetheless. This was my first Adams – and I have to admit, when browsing the samples and hearing that crackly, scratchy audio I was put off – but don't be. After the first minute you don't even notice.